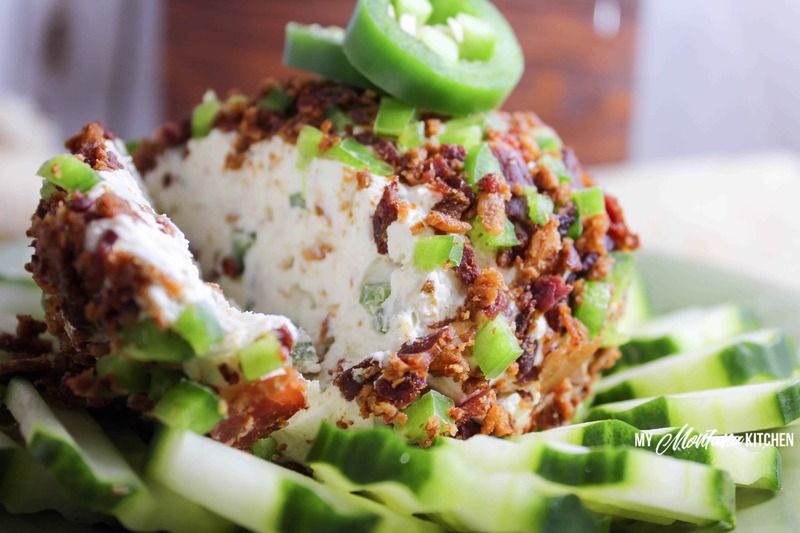 This creamy Bacon Jalapeño Cheese Ball is filled with smoky flavor, crispy bacon, and spicy jalapeños. The perfect appetizer for your next party! We are entering the time of year when there is always a social event to attend. Have you noticed how many of our social events revolve around food? If you are endeavoring to stick to a healthy eating plan, it can be difficult at times. One way to stay on plan is to bring something with you that you can eat. (Just make sure you go through the line early enough to get some for yourself! Ha!) 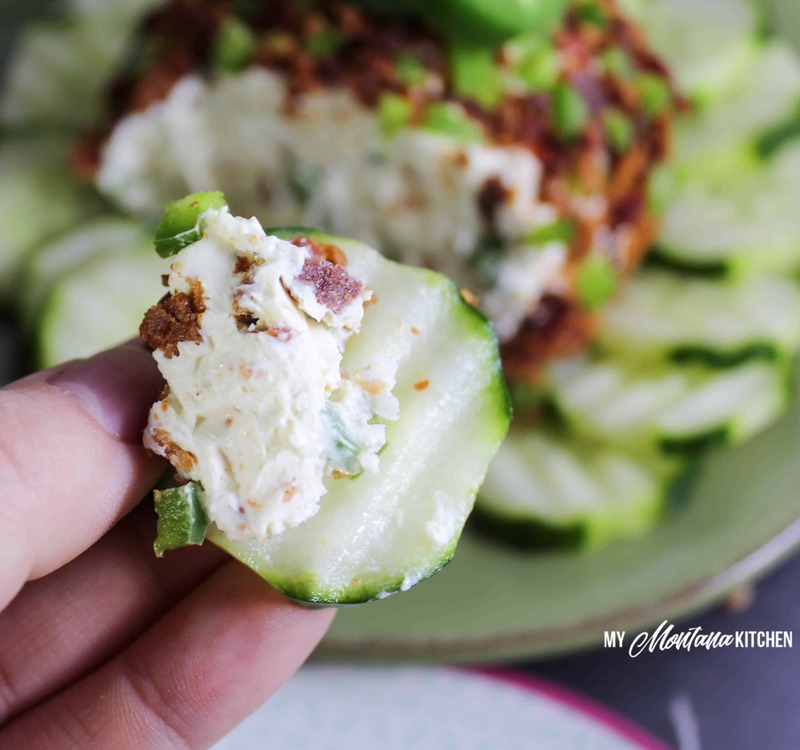 This bacon jalapeño cheese ball would be the perfect choice! Most people enjoy a good cheeseball, and most people enjoy bacon – put the two together and you have a winner! Not only is this an easy recipe, but it is completely customizable! If you like more heat, add a little extra jalapeño (and be sure to leave a few seeds for heat). If spice is not your thing, tone it down a little bit. You could also add a little shredded sharp cheddar cheese for some variety. This easy cheese ball is also teenage-boy approved! My husband and I are dorm parents at a school in western Montana, and my dorm boys demolished this cheeseball in minutes! 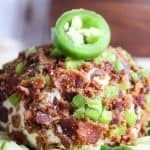 Bacon Jalapeño Cheese Ball? Yes, they loved it! 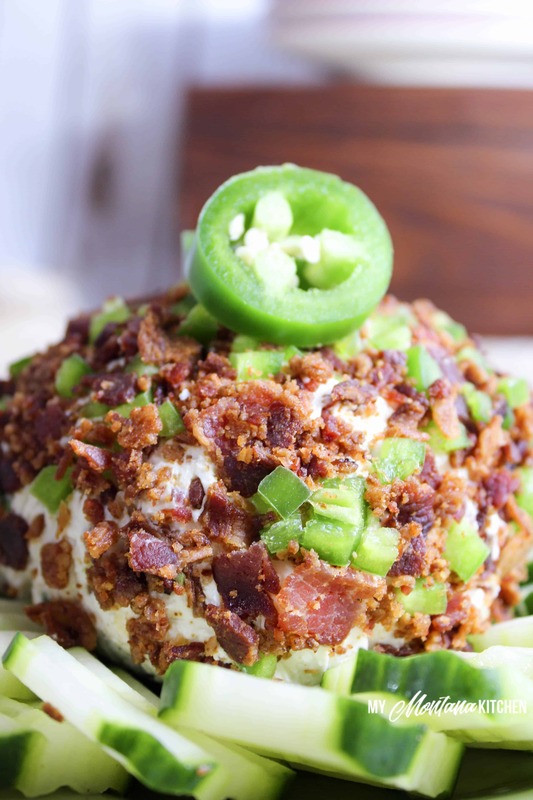 So, what do you need for this Bacon Jalapeño Cheese Ball? Serve this with cucumber slices or celery sticks for dipping. Or, you can use any of your favorite low-carb cracker recipes! You may also like Buffalo Bacon Jalapeño Poppers! In a medium bowl, mix softened cream cheese with 3 Tablespoons jalapeno, 1/3 Cup bacon, garlic salt and liquid smoke. Form into a ball, wrap in plastic wrap and refrigerate for 2 hours. Remove cheese ball from plastic wrap, and roll in remaining jalapenos and crumbled bacon to coat. Hi! This looks very good. My family doesn’t enjoy spicy food. Do you think I could make this with canned chopped green chilies and it would still have good flavor and texture? Do you have other suggestions? Thank you! Love your recipes! Absolutely! I think that would work fine. I would drain the canned chilis well before adding them to the cream cheese.